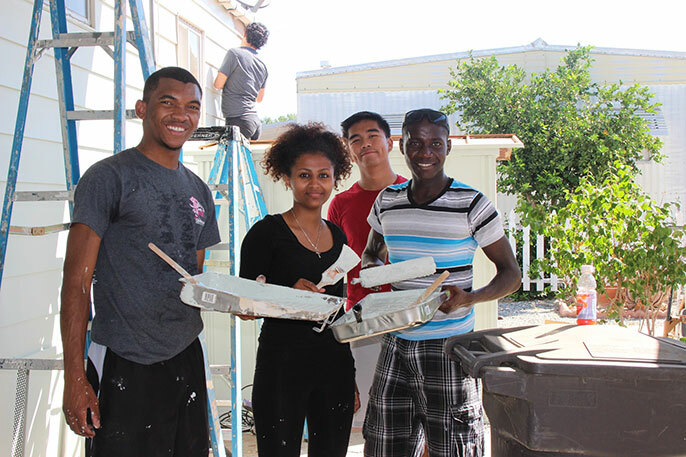 Students volunteer at Habitat for Humanity Riverside as part of the Summer Institute for Emerging Managers and Leaders, a UC-wide program hosted this year by UC Riverside. Fifty college students from around the country recently completed the University of California Summer Institute for Emerging Managers and Leaders (SIEML), which was held Aug. 7-20 at the University of California, Riverside’s School of Business. SIEML is a two-week all-expenses-paid career building experience for students from Historically Black Colleges and Universities (HBCUs) and Hispanic-Serving Institutions (HSIs). During the event, the students attended various events designed to teach entrepreneurship, business development, leadership and networking skills. The SIEML program also included a volunteer and community service component that emphasized the importance of corporate social responsibility in today’s global economy. Students met with leaders in education, business and the community, such as Dean Yunzeng Wang of UC Riverside’s School of Business; Dean Robert Sullivan of UC San Diego’s Rady School of Management; Senior Director of Admissions Kathleen Gleed of UC Davis; Dean Rich Lyons of UC Berkeley-Haas; Assistant Dean Jonathan Kaplan of UC Irvine Merage; and Ron Chandler, CIO of UCLA Anderson. Riverside Mayor Rusty Bailey and representatives from Facebook and Volkswagen also participated. Hands-on workshops were led by representatives from Wells Fargo, who conducted a résumé writing and interview skills workshop. The students also participated in an etiquette dinner hosted by Heidi Cuthbertson, associate director of UC Riverside’s Graduate Career Development Center. The students honed their networking skills at an alumni dinner hosted by Dean Wang at his residence in Riverside, California, where students met with distinguished staff and alumni. “I learned a lot about myself, how to be a leader and how to work with others. Lastly, I learned that life will take me places and with every place that it takes me, I have one goal and that’s to touch someone’s life and be a blessing. SIEML was an experience that gave me that,” said Jennifer Regena White, a sophomore from LeMonye Owen College in Memphis, Tennesse. Recreational and team-building activities gave students some relaxing leeway in an otherwise intensive academic program. These excursions included a weekend trip to Disneyland, working as teams on the High-Ropes Course at the Student Recreation Center Outdoor Excursion Course, and relaxing at a BBQ and pool party at the UC Riverside Student Recreation Center. “Attending SIEML 2016 was one of the best experiences I’ve had in my life. As a music education major, I thought I wouldn’t fit in. But now that it’s over, I have found a new family,” said Jenei Peterson, a sophomore at Claflin University in Orangeburg, South Carolina. Fifty undergraduates from around the country completed the University of California Summer Institute for Emerging Managers and Leaders (SIEML), held in August at UC Riverside’s School of Business. A concluding highlight of the program was the Deloitte Case Competition, where students teamed up and competed for cash prizes totaling $1,300. Led by Professor Sean Jasso and UC Riverside alumnus Nicholas Fiore, teams had a week to prepare for their case studies before presenting to a panel of judges comprising UC Riverside staff and business leaders from Deloitte. Thanks to this year’s sponsors Deloitte, Wells Fargo and Kaiser Permanente, the program was able to raise interest in the University of California’s six participating business schools and encourage students to continue their business educations at the graduate level. Some students will be coming back to complete their 2nd term in the SIEML program next year, where it will be hosted by the University of California, Irvine. The SIEML 2016 program was planned, coordinated and executed under the leadership of Kazi Mamun, assistant dean of Undergraduate Business Programs, and his team members Elizabeth Tisdale and Shannon Parfitt. Two student workers, Gerald Marquez and Lindsey Tabil, supported the students throughout the program and UC Riverside student Debbie Dinh covered their journey on social media and provided a firsthand account of what it is like to study at UC Riverside.